A beautiful smile is a synonym of health, vitality, satisfaction with life and well-being. Good-looking teeth with the right shape and colour are a prerequisite of a beautiful smile. Satisfactorily light colour of the enamel, as chosen by the doctor and the patient, can be achieved by performing the whitening procedure. Our clinic uses the most effective method of whitening with the specialist Beyond lamp. Whitening is always preceded by specialised examination. The doctor assesses the condition of the teeth and determines the scope of the treatment together with the patient. We are using the latest model of the Beyond Polus lamp with great success. The device does not produce harmful UV radiation or dangerous heat. The procedure performed at our Kraków clinic takes about 90 minutes and is preceded by professional hygienisation. The procedure is completely painless, and the effect of whitened teeth is visible immediately after the procedure. The lamp allows for teeth to be whitened by more than ten tones (compared to up to two tones with home solutions). The effect lasts from a few to more than ten years, depending on: patient’s lifestyle, oral hygiene and diet. After that period, reminder whitening can be performed. The VITA scale is used for choosing the desired colour of the teeth. In its classic version, the scale consists of 16 shades – from A1 to D4. Currently, good dental clinics use an improved version of the scale which allows better prediction of the whitening effect and selection of the best tooth colour for the patient. The latest VITA Toothguide 3D-Master scale includes up to 29 basic colours. 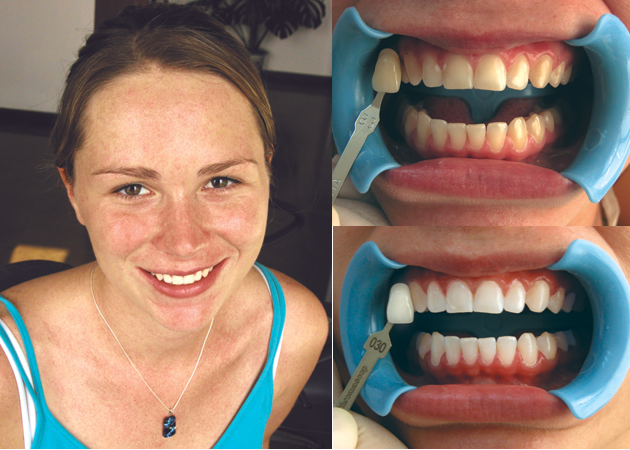 Before and after – the effect of tooth whitening with the Beyond lamp. Manufacturer’s materials. Medical examination – assessment of the condition of teeth, using the VITA Toothguide 3D-Master scale to determine the current colour of teeth and the desired whitening effect. Hygienisation procedure (scaling, sandblasting and polishing) to remove deposit and tartar. Application of a protective cream onto the lips. Gums are protected with a specialized preparation – cofferdam. The essential stage of whitening – a special gel is applied on the teeth and the whitening process is started using a Beyond accelerator. Teeth are exposed in three fifteen-minute cycles. The gel and cofferdam are removed, mouth is washed and the results of the procedure are evaluated using the VITA Toothguide 3D-Master colour chart. Use a diet containing no natural or synthetic dyes present in foods such as beets, red wine, blackcurrant juice, coffee, tea and other products for the first 48 h.
To avoid ruining the effects of the treatment, do not smoke for the first 48 hours. Use of a whitening toothpaste for daily oral hygiene is also recommended to keep up the whitening effect. For the whitening procedure, our clinic uses the Beyond Polus lamp from the American company Beyond Dental and Health. It is a state-of-the-art device, repeatedly recognized as the best whitening system by the American institution Dental Advisor. The Beyond Polus lamp is one of the safest devices, its quality confirmed by medical certificates: CE, FDA and ISO. An overlay whitening system is slightly cheaper (PLN 600-900), yet much more uncomfortable for the patient and it is much harder to predict if the desired white teeth effect will be achieved. Unfortunately, not all discolouration of the teeth can be removed by whitening with a lamp. 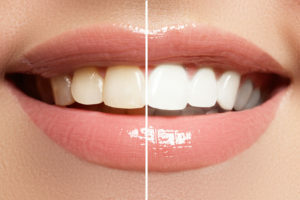 Types of discolouration resistant to whitening substances include: discolouration of dead teeth, hyperpigmentation caused by systemic diseases, also resulting from the use of tetracycline drugs. 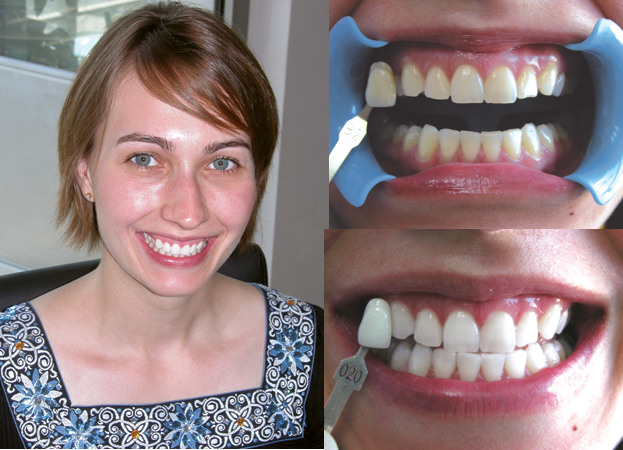 In these cases, the desired whiteness of the teeth can be obtained by applying veneers or crowns.